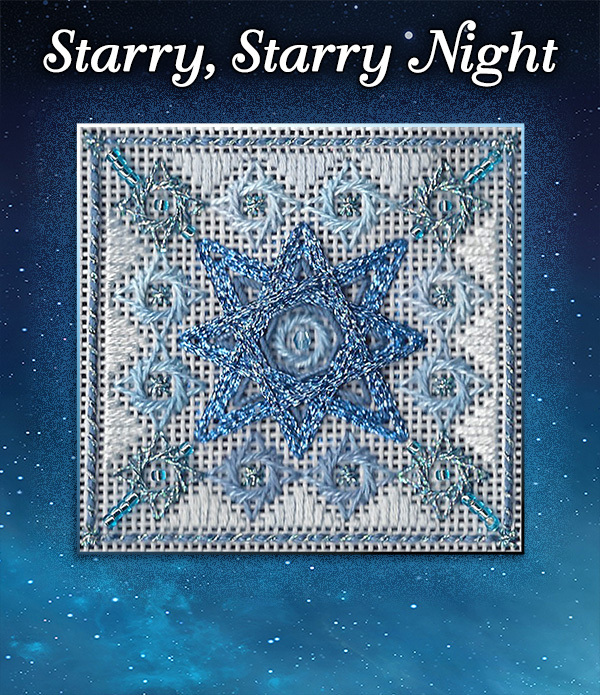 Starry, Starry Night features a variety of twinkly, twisty stitches in a variety of threads to create a palette of stars. The name derives from the popular Don McLean song, “Vincent (Starry, Starry Night)” which pays homage to the artist Vincent van Gogh. Perhaps the song will run through your mind as you stitch! All of the stitches are individually diagrammed. Use the photograph on the front cover to see how the various elements fit together in the design. Finish this piece as an ornament, a pin, a pendant, or even as a small box top. This design is a revision of a 2006 ornament designed by Michael Boren, revamped with revised directions and fresh (meaning available!) threads. He has included a list of possible colorways, but we encourage you to use your favorites from your stash!